Those who visit Imbu Rano Lodge for the first time are usully overwhelmed by the location, the stunning views and the pleasant, spacious accommodation. When the managers at KFPL teamed up with the scientists studying Kolombangara over many years, the result of the collaboration was bound to be something special. Imbu Rano is a labour of love. It was designed by KFPL architects and built from solid FSC certified timbers sourced from the KFPL plantation forests on Kolombangara Island. It sits atop a ridge overlooking the Vila River valley and looks directly out and up to the two major peaks of the Kolombangara crater rim - Mt Rano (1698m) and Mt Tepalamenggutu (1708m). The views from the 18m expansive deck are breathtaking and ever-changing. Look away and back again a few minutes later and it has changed - the mist and clouds created by the high mountains come and go. The morning and evening light offers fabulous colours, a rainbow or sunbeams. You can regularly watch birds sweeping across the valley or landing on nearby branches. Imbu Rano Lodge was primarily designed as a base for scientists researching the high altitude forests of Kolombangara but is also ideal for the adventurous trekker or curious sightseer wanting to experience the high-altitude rainforests and wildlife. 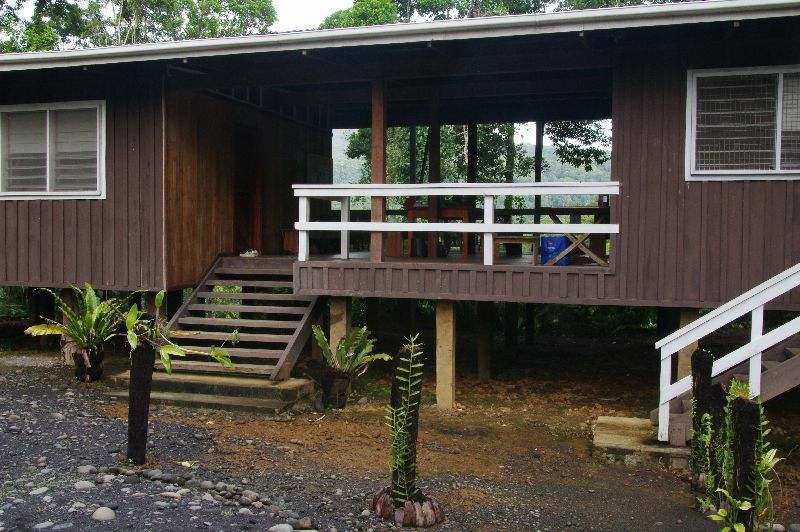 A list of scientific papers and reference books has been assembled at Imbu Rano Lodge for those wanting to learn more about the ecology of the Island. Being at 370m altitude, you are well-placed to climb further up a long ridge connecting the crater rim, or dash down to the Vila River and follow it to waterfalls, kustom sites or into the crater centre. A transfer vehicle takes you from your boat at the Ringgi Cove marine base to the doorstep of Imbu Rano. Why walk to get to the best rainforest! The lodge offers two twin rooms (one with two beds, the other with three), a 10-person bunk room, linen/towels and shared kitchen and amenities. Drinkable tank water, solar-powered lighting and 24-hour security. The kitchen is well equipped with plates, bowls, cooking utensils, and gas burner. AC solar power for charging camera etc available. Book the whole lodge for added privacy or large groups. We'd love to hear from guests about your stay at Imbu Rano Lodge, so leave your comments below. The name for the lodge, Imbu Rano, was selected after a competition amongst those living on the island. ‘Imbu’ means mist or cold in the Roviana language of the region (in the Nduke language of the Kolombangaran people, ‘Ibulu’ is the related word for cold). The lodge looks out over the Vila River valley and across to the high crater rim summit of the 1,698m Mt Rano, one of the highest peaks of Kolombangara Island. Imbu Rano Lodge is owned and managed by KFPL. KIBCA assists with its promotion and management as part of the KFPL and KIBCA joint management of the 400m conservation area. I really enjoyed my visit to Imbu Rano Lodge. I slept on the deck and woke to the sounds of the rainforest birds. Well done KIBCA and KFPL for running such a good base for walking and enjoying Kolombangara Island. Great place - really interesting information about the volcano, wildlife and origins. Magic setting to hear birds, wildlife and wake up to amazing view. I'll be back!! Amazing work in creating Imburano - a place worth visiting.The views yes! definately stunning! I used to stay at Imbu Rano regularly when my family lived on Kolombangara, it is a great place to relax take in the incredible view, i also slept out on the deck which was cool and comfortable, it also serves as a great base for either day trips, or more extensive expeditions around the reserve. I visited Imbu Rano again after visiting several times six years ago and it is still impressive. The main difference is that there are now solar-powered lights. That view from the balcony remains as stunning as ever. Did an enjoyable daywalk that involved the short walk down to the Vila River, a side-trip to Myles Falls, upstream along the Vila River banks and then returned to the ridge at Pig Camp via the Loop Track.